with a scale of (that is, the model sill) and a range of , based on the weighted least squares fitting results in the PROC VARIOGRAM example. The first choice is whether to use local or global kriging. Local kriging uses only data points in the neighborhood of a grid point, and you choose this type of analysis by specifying a data search radius around the grid point. Global kriging uses all data points. For a Gaussian model, is 52,000 feet. The data points are scattered uniformly throughout a ( ft ) area. Hence, the linear dimension of the data is nearly double the range. This indicates that local kriging rather than global kriging is appropriate because data that are farther away than essentially add to the computational burden without significant contribution to the prediction. The following DATA step inputs the thickness data set thick, which is available from the Sashelp library. In the thick data set, thickness is represented by the Thick variable. Local kriging is performed by using only data points within a specified radius of each grid point. In this example, a radius of 60,000 feet is used. Other choices involved in local kriging are the minimum and maximum number of data points in each neighborhood (around a grid point). The minimum number is left at the default value of 20; the maximum number defaults to all observations in the data set within the specified radius. The last step in contouring the data is to define the prediction grid point (node) locations. The prediction grid is typically rectangular, and you decide on the grid points population and spacing based on your available data in addition to your application needs. A convenient area that encompasses all the data points is a square of side length 100,000 feet. In the present analysis, a distance of 2,500 feet between nodes in the prediction grid is selected to obtain a smooth contour plot. Based on this choice, you obtain predictions on a square grid with 41 nodes on each side, which yields a total of 1681 grid points. You can visualize the outcome of your analysis by using the PLOTS option in the PROC KRIGE2D statement. By default, PROC KRIGE2D produces one plot that displays the kriging prediction and its corresponding standard error at each output grid point. The locations of the Thick observations are displayed too, as outlines in the default plot. You can also ask for a plot of the thick data set observations and their values by specifying the OBSERV option in the PLOTS option. The kriging analysis with the KRIGE2D procedure requires that you provide the prediction parameters in the PREDICT statement. You use the VAR= option to specify that you want to use the Thick variable in the kriging system, and the RADIUS= option to specify the radius of the local kriging regression. In this scenario you want to consider for your predictions all the neighboring data within a radius of 60,000 feet from each prediction location. You can specify more than one PREDICT statements; for example, you can do this when you want predictions for different variables in your DATA= data set. The coordinates of your variable are specified in the COORDINATES statement. The MODEL statement contains the parameters that describe your data spatial correlation. Namely, the FORM= option specifies the model type, based on its mathematical form. The SCALE= and RANGE= options specify the model sill and range, respectively. You can specify more than one MODEL statement for the same PREDICT statement in order to obtain predictions based on different correlation models. When you use the RADIUS= option to perform local kriging, as in the present example, it is suggested that the radius parameter be at least as large as your model range, so that you include data points that can contribute to your prediction. The table in Figure 49.1 shows the number of observations read and used in the kriging prediction. This table provides you with useful information in case you have missing values in the input data. Figure 49.2 shows some general information about the kriging analysis. This includes the count of the output grid points. You have specified the RADIUS= option; therefore you also see that local kriging is requested. Because this is a local analysis, the table also displays the parameters related to the neighborhood search around the grid points. The covariance model parameters, including the effective range of the Gaussian model you specified, are shown in Figure 49.3. 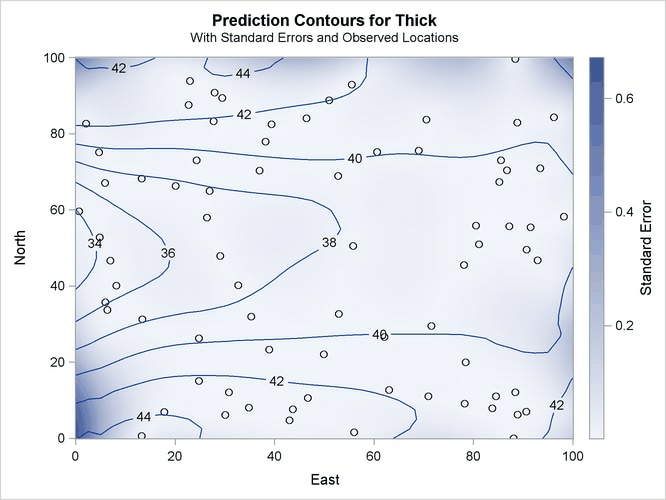 Figure 49.4 shows a map of the kriging prediction contours based on the Thick observations in the specified spatial domain. The prediction error is displayed as a surface in the background. Note the locations of the observed data in Figure 49.4. The figure suggests that the Thick sampling locations are not ideally spread around the prediction area; however, there are no extended areas lacking measurements. Based on the spatial distribution of the Thick data and the range of your covariance model, you can roughly see that for each prediction location there are at least several neighboring data points that contribute to the prediction value. Except perhaps for the nodes close to the boundaries of the prediction grid, you can then expect the prediction errors to be reasonably low compared to the predicted Thick values. The kriging outcome in Figure 49.4 indicates that the standard errors are smaller in the neighborhoods where data are available. The size of these neighborhoods depends on the range of the specified covariance model that characterizes the spatial continuity of the domain, and on the prediction radius, if one is specified as in this example. The standard errors tend to increase toward the borders of the prediction area, beyond which no observations are available.